Is Microsoft Wrong Investing That Much on Office 365? I wouldn’t say that I've been in this IT world for a very long time, but enough to see the changes happening and the impact it’s having on my peers. I remember discussions when visiting customers as a consultant, Microsoft is way too slow and they aren't keeping up with what’s happening in the market. Now, I hear discussions around how it’s changing too fast and Microsoft is adding too many things too quickly. This reminds me of a recent newspaper headline complaining that Gas prices are now too affordable. I disagree and am liking the new direction they're taking in general. Here, I am talking about people in the organization, the people who need to get stuff done so that their organization succeeds in whatever they do. The reality today is that they are finding other ways to do what they need to do, IT is slow in responding or simply blocks what they need. A few customers I’ve visited in the last couple of months mentioned business units are using Dropbox, OneDrive, WeTransfer, Facebook Groups and even private YouTube channels to get the job done. Technology has moved so quickly that we can subscribe to or use online services that meet our needs without having to go through IT. This is amazing for the business in some ways and is one reason O365 is here. Microsoft’s challenge is to keep up with the rapid-paced demand of the people in organizations who now expect the same features that cloud-based services are offering. It has to compete against these companies, who have nothing to do but focus on these challenges, whereas Office 365 is a complete Microsoft Suite that needs to play well in many spheres. I see IT as the main challenge for Microsoft's cloud platform to be successful. In fact, I recognized the tone and discussions when SharePoint started being popular, but it wasn’t with IT. It’s from the days where, I would tell people about implementing SharePoint to replace their file shares, that they would stop putting things in Folders and use Metadata instead. Change is here and it’s time to adapt. First, it was often about the security of the Cloud and putting data on Office 365. Then, it followed with talks on the cloud being just a phase that will soon fade away. And now, it’s the speed at which it changes and the lack of control. The challenge isn’t so much in keeping up with the changing market as much as showing IT that they can work together. I am, of course, generalizing and definitely not saying everyone in IT is saying this at all, but I am hearing this even if sometimes those are not the words that are said. Amongst the many discussions, some valid arguments are made about Microsoft's cloud platform. I talked earlier about the lack of control with some of the things released to the business. It’s difficult, because on one hand we have the business that needs to be able to use it easily. On the other hand, IT needs to be able to manage and control the service available to these users to protect them and the organization. I don’t envy the O365 team because they need to satisfy both teams to stay in the game and they don’t always want the same thing. When Groups for O365 were released, IT wanted more control over them but in most cases it was to disable them. This would be counter productive because it would mean no one would use them and we'd go back to the old ways of adding features that no one needs because we don't know how they use them. In turn, the business will start to look at other things outside Office 365 that answer their needs, but once again IT loses control. I don’t have the answer myself and the more I think about it, the more I am OK with it. There are times where it’s OK not to have control. For a while now and like others, I've seen it as On-Premises vs Cloud and now I see that it doesn't have to be. There's immense value in Office 365, I think denying it would be a mistake. Just looking at the new Promising Video Portal is a great example of quick value you can get out of it. However, there are certain types of content we may not yet be comfortable putting on the Cloud. This could be anything, no one at Microsoft ever said there will no longer be an On-Premises version of SharePoint and in fact we’re expecting a new one very soon. My advise would be to acknowledge the value that Microsoft's platform has for the organization and work with it to provide solutions while still managing and controlling your content. For example, SharePoint is a solid enterprise solution On-Premises and allows you to do what you want and control how it is being used. You can have people use the On-Premises SharePoint for A, B and C activities of the organization. 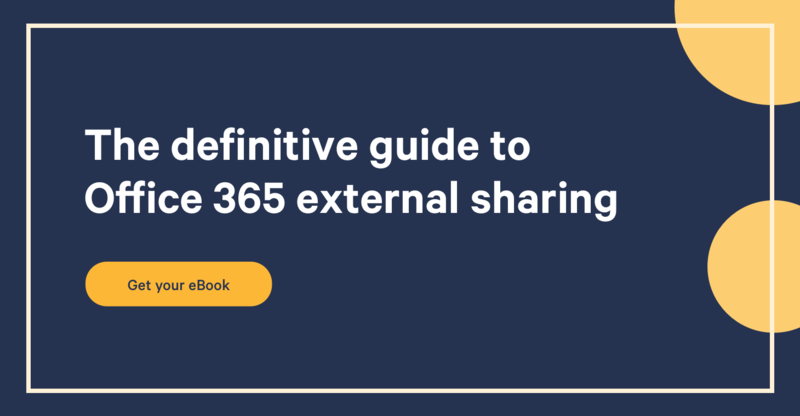 And allow D, E and F activities to be done on your Office 365, which provides the solutions they would otherwise use other products for anyway. Change is happening, and I understand it can be difficult to, once again, learn something new that comes with new challenges. I understand that for some, it may be scary to think that what you’re used to do will not be needed anymore because it’s already available or done by Microsoft. But it doesn't mean IT is disappearing, that we do not need IT or that you will lose control. It means we need to step back, look at what people are doing in our business or organization and provide them with what they need for them to be successful in what they are doing. Office 365 is not a phase nor does it lack control or security. It’s not perfect, but I believe Microsoft has awoken from its slumber and is finally headed in the right direction. There will be bumps on the road, but from what I have seen I am convinced it will only get better. What do you think? Is the platform changing too much and could Microsoft be wrong?